In July of this year we popped over the popular tourist part of Slovenia. 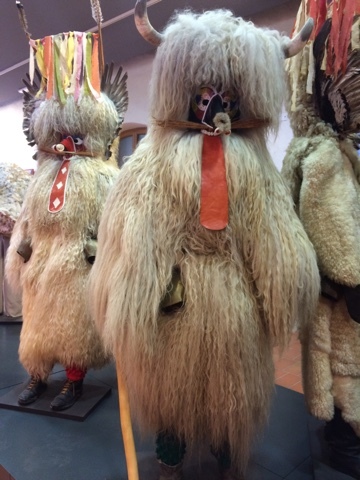 This time we came from the North into Ptuj, continued South and then west. We were lucky to approach the enormous Pleterje Monastery from above (a road on a hill that is), which allowed us to see its size. At the monastery one can only visit the simple church (but I prefer churches to be simple) and it was made all the more memorable because, as we sat in the church, we could hear the monks singing. 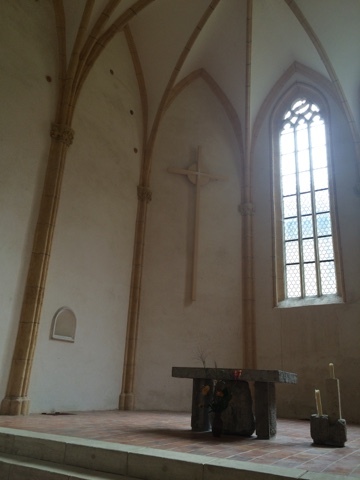 Imagine sitting in this church and hearing monks singing together behind the wall. Next door to the monastery is the 'Pleterje Open-Air Museum'. Here we were again the only tourists and so had a wonderful guided tour and learnt so much about a Slovenian way of life from years past. 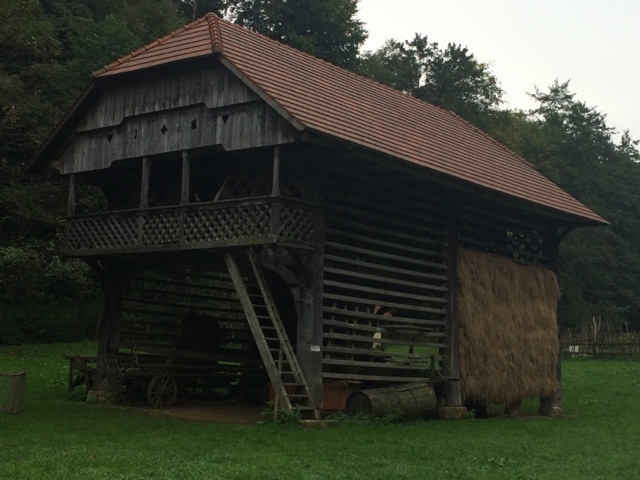 One of a few styles of Slovenian hay-rack. 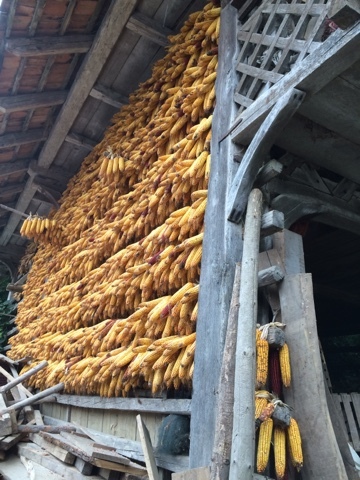 Hay or corn is dried on the rack part, equipment stored underneath, and in days past the family's boys would sleep up top instead of in the cottage. Then we followed the Krka River: beautiful historic towns, and many castles, and lot of hay racks. Many old hay racks on farms are still being maintained and used. After doing all these things quite alone, we then found the bus loads of tourists at 'Postojna Cave'. These caves are wonderful, and big, and they handled their thousands of visitors very well and deserve all those tourists. 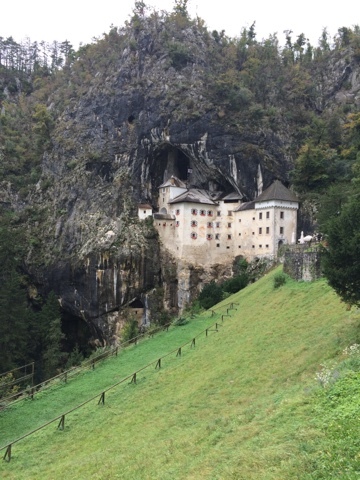 And then we checked out the castle built into the mouth of a cavern, 'Predjama Castle' (we just drove up and looked at the outside, but we're glad we did). I bet some of the rooms of Predjama Castle are really dark. 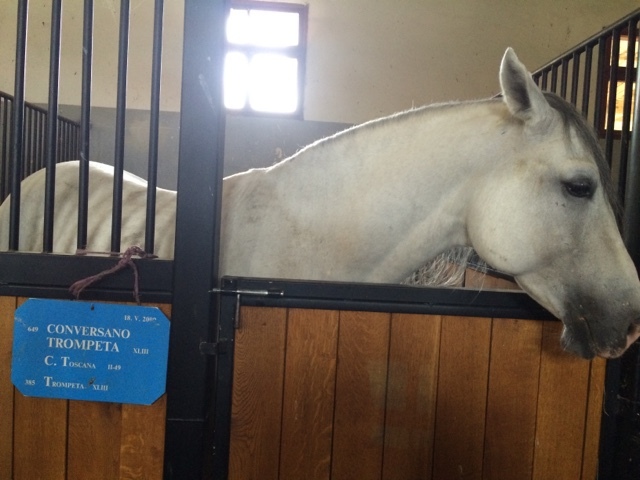 Then, keeping our Slovenian touring even more varied we visited the oldest planned breeding stud farm in the world: for Lipizzaner horses at Lipica. The horse stud, visited on a guided tour, is lovely. With limited blood lines breeding is strictly controlled. Each stable tells the horses birth date, it's name, and from which horses it was bred. 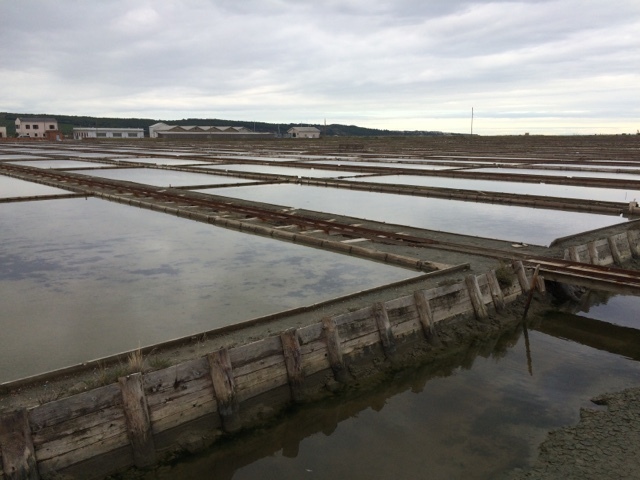 At finally, we visited the historic salt pans (some still in use) on the Slovenia-Croatia Coast. The salt mines are very interesting and have an appeal in an industrial-artist sense. Unfortunately we were there on a grey day. Slovenia is certainly an impressive country, but, the part where the monastery is can get to -15 degrees Celsius- that's way too cold for us!